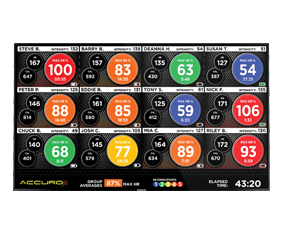 The AccuroFit Dynamic Heart Rate Training Display allows you to wirelessly display individual and group performance results on to a single or multiple screens around the studio or club. Your members can track workout data in real time, track their heart rate zone and calories burned, as well as their heart rate summary at the end of a session. Members will also have the ability to track past performances utilizing the Accuro Health App.